​We're honored to have been asked many times to bring the spirit of Ireland to the celebration of life or memorial reception for our clients' loved ones. Whether you're looking for a real Irish wake or just some lovely Irish background music during a reception, we can adjust our sound and mix to suit the occasion. Wow! All I can say is WOW! This band was great and they knew just how to cater their amazing talents and music to match the setting. They were right on time and very professional. They were able to happily interact with a diverse crowd of people and made our event truly special. I would hire them again in a heartbeat. 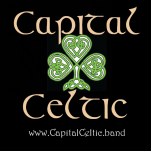 Thanks to everyone at Capital Celtic!